From the 1880s Chinese laundries were often attacked in many ways for decades. They were condemned not only for taking jobs from Americans but for sending their profits back to China rather than spending it in the U. S. Chinese laundries were depicted as unsanitary and dangers to the health of customers. (In addition, Chinese laundrymen were robbed, assaulted, and even killed). 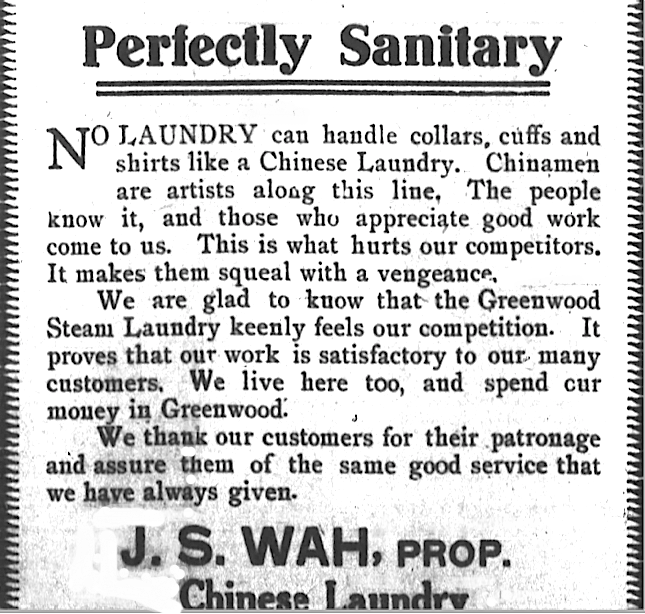 A white-owned steam laundry in Greenwood, South Carolina, made these points in its 1915 rant against a local Chinese laundry. The presumed target of this screed was J. S. Wah, a Chinese who took the high ground in his measured reply, “Perfectly Sanitary,” published the following week in the local newspaper. Wah turned the tables on the Greenwood Stem Laundry by describing its complaints as the whining of a sore losing rival. He concluded by emphasizing that he contributed to the Greenwood economy and thanks his loyal customers.